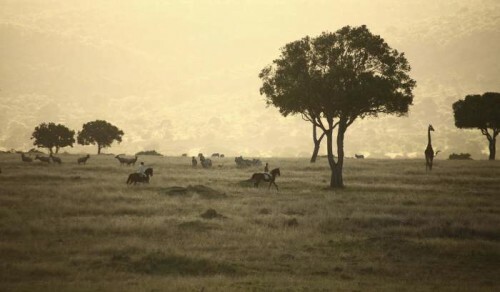 A horse riding safari in Kenya makes for a wonderfully unique adventure, in this case crossing the entire Laikipia plateau on private land. Your chances of seeing spectacular game are far higher than those of seeing another tourist and you will have a beautifully exclusive experience. As you cross some of Africa’s most iconic scenery, you are likely to encounter elephant, buffalo, hippo, giraffe, zebra, and many antelope. The Laikipia Plateau harbours more endangered species than anywhere else in East Africa. Lion and leopard sightings are not uncommon and the area is also known for its growing population of wild dog. Riding with wild dog is a rare and exciting privilege for those lucky enough to encounter them. 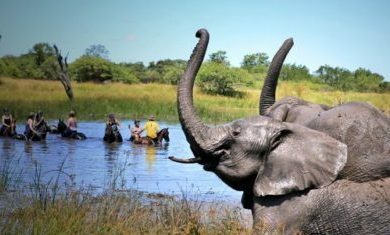 This trip perfectly combines the wonders and adventure of riding in the African bush and encountering game, with those well-loved creature comforts, beautiful lodges and numerous bush meal indulgences. 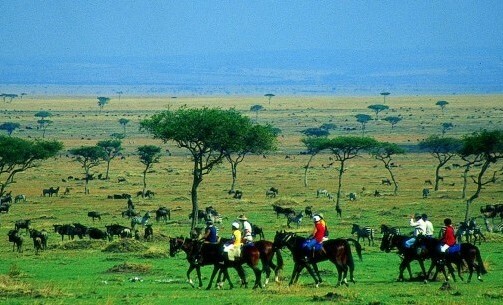 Fabulous scenery, delicious food and excellent accommodation make this an unforgettable horse riding safari in Kenya. 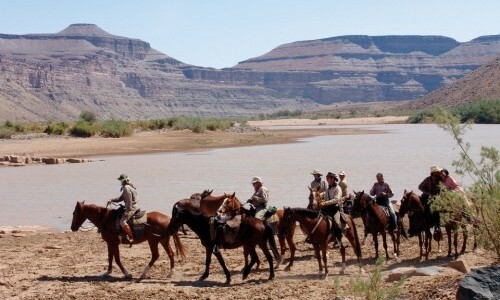 This expedition throws much more than just horses into the equation, offering a huge range of activities such as; day and night game drives, horse riding, walking, fishing, fly camping, camel treks, waterfalls, kayaking, swimming & cattle ranching on the Sosian ranch. This great range of activities makes this the perfect riding package for those wanting to combine trips with any non-riding guests or for those that want to do more than ride. Riding through some of Africa's most iconic scenery which offers the chance to pick up the pace and enjoy the freedom of Laikipia's plains. Over 24,000 acres of private and untouched wilderness to explore with just one 14 bed lodge. Spectacular bird and game viewing opportunities. 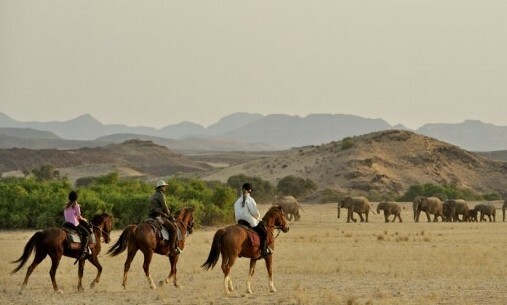 A huge range of activities; day & night game drives, horse riding, walking, fishing, fly camping, camel treks, waterfalls, kayaking, swimming & cattle ranching. 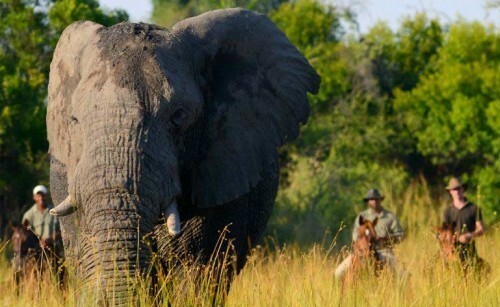 An excellent combination of a true bush experience with understated luxury and all those creature comforts. When Open all year round except the months of May and November. 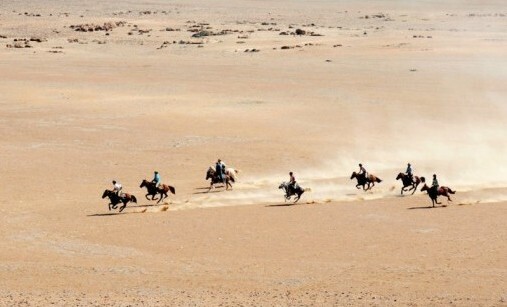 Riding Level Beginners can take lessons and ride in the gardens of Sosian. Intermediate + can ride out. From the foothill of Mount Kenya to the shores of Lake Baringo, the Laikipia Plateau is one of the lesser known wildlife areas of Kenya. This beautiful pristine landscape is home to many of Africa’s most endangered species such as wild dog. On the plateau sightings of Grevy’s zebra, hartebeest, reticulated giraffe, ostrich, oryx and gerenuk. There are also thriving populations of elephant, lion, leopard and cheetah. The big open plains and scraggy bush make excellent riding terrain, without another soul in sight and surrounded by the African wilderness – bliss. With many years of careful management, the wildlife on Sosian has flourished. There is a diverse cross section of habitats that host a long list of birds and mammals, including elephant, hippo, buffalo, lion, leopard, cheetah, hyena, giraffe, zebra, kudu, oryx, impala, warthog, plus many smaller predators such as bat-eared foxes, genet cats and serval cats. Sosian has also become known for its healthy population of the endangered wild dog. With sophisticated tracking equipment they are able to locate these fascinating predators and often follow them by vehicle, on foot or from a horse. Wildlife viewing is rewarding, whilst still maintaining the true wilderness of the area, which makes each sighting all the more special and exciting. Rides at Sosian can be tailored to suit you. This is 7 night fixed ride itinerary. Day 1: Collection from either Jomo Kenyatta International Airport or your Nairobi hotel. You will then be transferred to Wilson Domestic Airport in time for your flight with Safari Link, to Loisaba airstrip. The flight lasts approximately 60 minutes and is a great chance to see Kenya from the air. On arrival, a member of the Sosian team will take you on your first game drive to Sosian Lodge just in time for a delicious lunch. The journey lasts about 1 hour and on your way there is a strong chance of you catching your first glimpses of some of Africa’s wildlife; giraffe, plains game and even the odd elephant. After you’ve had lunch and a chance to settle in, relax by the pool or a quick freshen up. Head to the stable yard for your first chance to meet your horse and mount up for your first evening ride with your guide. Day 2: At Sosian the days are tailored to suit you, but this morning an early ride and bush brunch is the recommended way to start the day and have your first explore of the area. Whilst the horses (and yourselves!) cool off in the shade of an Acacia tree, enjoy a delicious home cooked meal surrounded by the sounds of the bush. Sosian boasts large numbers of elephant, as well as buffalo, hippo, giraffe, zebra, many antelope and of course all the big cats! Lion and leopard sightings are not uncommon and the area is also known for its growing population of endangered wild dog. Return in time for dinner and spent your second night at the beautiful Sosian Lodge. Day 3: After waking up to yet another wonderful African morning, leave Sosian early and ride north-east, stopping for breakfast at a stunning spot on the Ewaso Narok River. Breakfast finished, you will cross the river and continue riding for a couple more hours before reaching Suyian Soul, Laikipia’s ultimate ‘eco camp’. Suyian Soul is a fuss-free camp, set next to a natural spring and salt lick, the camp forms an idyllic bush haven. The camp is owned by Anne – Kenya’s number one botanist and fascinating raconteur. The rooms are thatched open bandas with granite walls and each room is carefully positioned to get an excellent balance of great views but also privacy. Staying here will feel like a true bush experience whilst also having the creature comforts of an en suite bathroom, large comfortable bed and traditional safari showers. Following lunch, set out on foot with Anne and her guides in order to learn about the medicinal qualities of many plants and their use from local tribes-people. A fantastic opportunity to spend the afternoon with an expert. Day 4: Leaving Suyian in the morning, mount up and ride out through exclusive valleys, dramatic escarpments and expansive grasslands. Sightings of elephant, reticulated giraffe, ostrich, hippo, zebra, buffalo, lion, plus large herds of oryx, eland and gazelle can be seen on the plains so keep your eyes peeled! 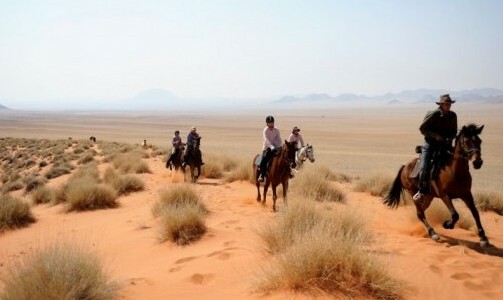 The plains that surround Suyian make for excellent riding terrain and invite some faster riding this morning; long canters through the bush and jumping any obstacles along the way. You will pull over for a bush breakfast on your way to the Loisaba Conservancy and later reaching Kiboko Starbeds, just in time for lunch. After lunch there is the option to head out on a game drive - from the vehicle you can get closer to some of the big game such as lion. Return to base for hot showers and a delicious supper. Tonight will be spent at Kiboko Starbeds; a camp with 4 sleeping platforms designed for 1 to 2 people. Each platform is en suite with a plumbed shower and toilet. The star beds are made on wheels, their unique design allowing you to wheel them onto the open deck area for a night spent under the starry African sky – a very special experience. Day 5: Riding out this morning, change direction and begin your journey back southwards. 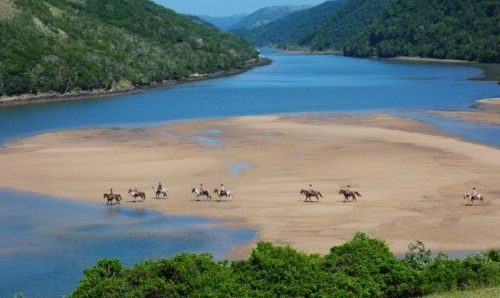 A lovely ride through the bush will lead you to your bush breakfast, set up next to a shady dam where the horses can be watered and you can enjoy a full English breakfast. Once everyone is sufficiently fed and watered, you will set off again for the Ewaso Nyiro River, crossing onto Ol Donyo Lemboro Ranch and reaching Laikipia Wilderness Camp in time for lunch. Laikipia Wilderness Camp is a cosy and exclusive bush camp, with just 5 tents. Each tent has its own veranda, a lovely place to relax, and out back they are equipped with an en suite open-air bathroom with plumbed hot and cold water. The spectacular views of Mt Kenya, and the surrounding wilderness, make this a beautiful place to spend the night. After lunch and an optional siesta you can choose to either, go out for a game drive or take a walk with Steve Carey, the owner of Laikipia Wilderness Camp. Steve and his team are well known for tracking wild dog and encountering them on foot is an exhilarating and unforgettable experience. Day 6: An early start today as you head off into the lush Mutara Valley – often referred to as an African ‘Eden’. Follow the seasonal river bed where you may come across giraffe, elephant, eland and buffalo to name but a few! Stop in the shade for yet another special bush breakfast. After breakfast start your last leg of the journey as you head back to Sosian in time for lunch by the pool and a well-deserved afternoon of relaxation. This evening you have the option for a last game drive or camel ride to your sundowner spot where a bush dinner will be served around the campfire. After sitting round the fire and reminiscing about the week's adventures, you will set off back to camp - you may even be lucky enough to spy one of the resident leopards on the way back to the lodge. Day 7: You may choose how to spend your day; there is the option to ride again for those who wish – why not pop round the cross-country course or, if the dams are full, take the horses for a play in the water. You can jump off waterfalls, kayak, try your hand at cattle ranching or simply spend the day relaxing and topping up your tan at the lodge and in its lovely gardens – the itinerary is completely adaptable! Overnight at Sosian. Day 8: After breakfast, bid a sad farewell to the horses and your team before jumping in the vehicle for one last game drive back to Loisaba airstrip in time for your return flight to Nairobi. Once you arrive at Wilson Airport, you will be picked up and transferred to Fairview Hotel, where a dayroom will have been booked. Enjoy some lunch and a chance to relax or even go shopping in Nairobi. Later that evening you will be picked up and dropped at Jomo Kenyatta International Airport in time for your flight home. is situated on a beautiful 24,000 acre wildlife ranch; the original house was built in the 1940’s by Italians and is wonderfully restored to accommodate 14 people. The Lodge, with its backdrop of Mt Kenya, fabulous swimming pool, tennis court, organic vegetable garden and stable yard is an excellent base for any African getaway. 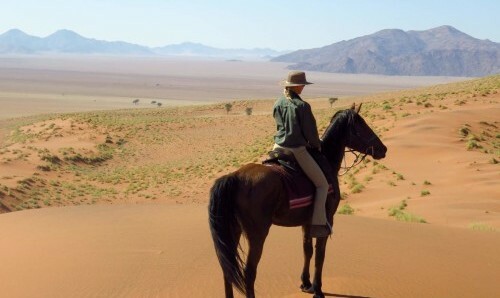 This is true unspoiled Africa at its best. A fuss-free camp, set next to a natural spring and salt lick, the camp forms an idyllic bush haven. The camp is owned by Anne – Kenya’s number one botanist and fascinating raconteur. The rooms are thatched open bandas with granite walls and each room is carefully positioned to get an excellent balance of great views but also privacy. Staying here will feel like a true bush experience whilst also having the creature comforts of an en suite bathroom, large comfortable bed and traditional safari showers. Kiboko Starbeds; a camp with 4 sleeping platforms designed for 1 to 2 people. Each platform is en suite with a plumbed shower and loo. The star beds are made on wheels, their unique design allowing you to wheel them onto the open deck area for a night spent under the starry African sky – a very special experience.